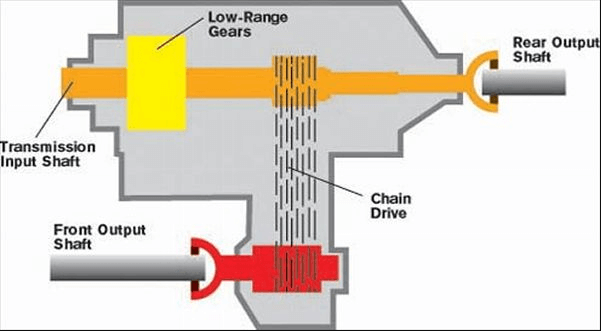 The drivetrain is a mechanical system with-in a motor vehicle which connects the transmission to the drive axles. A typical drivetrain contains a series of parts, working together to transfer the rotational power produced by the car engine, all the way to your wheels moving the car. You may have come across the word “powertrain” before. Powertrain is often used in the same because, the powertrain incorporates drivetrain. When trying to explain “what powertrain is”, powertrain encompasses EVERYTHING involved with the: car engine, transmission/transaxle, and the drivetrain. Drivetrain components are separate from the engine components but closely involve transmission components. What are the different Drivetrains? There are Four common drivetrain arrangements: Front-Wheel Drivetrains (FWD), Rear-Wheel Drivetrains (RWD), Four-Wheel Drivetrains (4WD), and All-Wheel Drivetrains (AWD). In the auto industry, FWD meaning refers to Front-Wheel-Drive. This is where the front wheels of an automotive vehicle will have the engines power to pull the vehicle into motion. The creation of the front-wheel-drivetrain dates back to the 1920s, where a government branch named CAFÉ (corporate average fuel efficiency) stumbled upon this inversely innovative drivetrain. The Front Wheel Drivetrain demonstrated early on its ability to generate increased miles-per-gallon, especially in small cars. Many cars on the road today are front-wheel drive, instead of the rear wheels powering movement, the front wheels do. A great way to identify a front wheel drive vehicle is when you open up the hood of your vehicle and see the engine runs horizontally and not vertically. This is called a “transverse engine” placement. This is where all the components of the front wheel drivetrain — transmission, differential, and drive shafts — are in the front of the car. In order to fit all these components in the front, engineers arranged to place the engine sideways in the car. The traverse engine setup enhances power delivery to the front wheels, due to having the motor’s weight directly over the driven wheels; Which improves vehicle acceleration and traction control on harsh road conditions. Weight distribution also plays into FWD’s advantage for corner/turning maneuverability. Consequently, you don’t need a long drive shaft that runs the length of the car to transfer torque to move the wheels. So, instead of a transmission, most front-wheel drivetrain vehicles will have a transaxle. A transaxle combines the transmission and differential into one single unit. While most cars that use transaxles will mount them right next to the engine, some sports cars –with rear located engines– use transaxles on rear-wheel drive trains for even weight distribution. 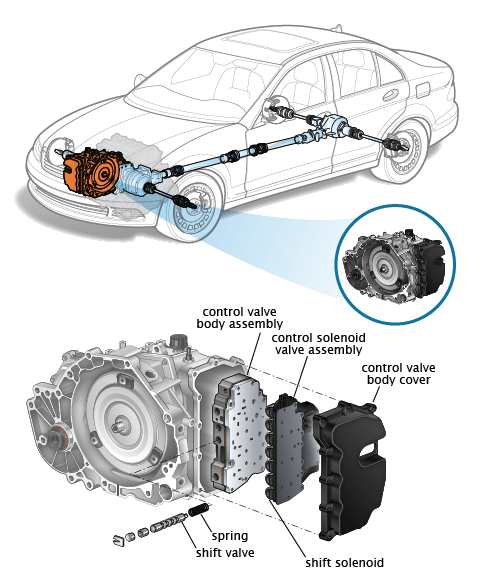 For Front Wheel Drive vehicles, the component mounted behind the trans-axle is the transfer case – a separate gearbox that directly connects to the front drive axle — purposed for sending power to the wheels. This is done with gears, hydraulics, or a chain drive. On some vehicles, such as four-wheel-drive trucks or vehicles intended for off-road use, this feature is controlled by the driver. The driver can put the transfer case into either “two-wheel-drive” or “four-wheel-drive” mode. The transfer case also synchronizes the differentiating rotations of the front and rear wheels. 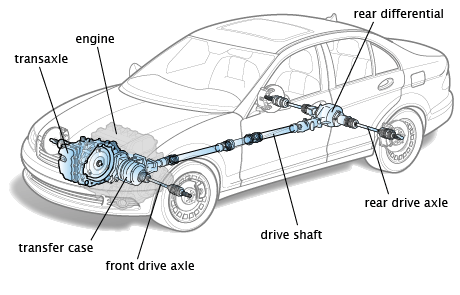 A vehicle’s drive axle is the component that connects the two wheels in the front, along with the two wheels in the rear. 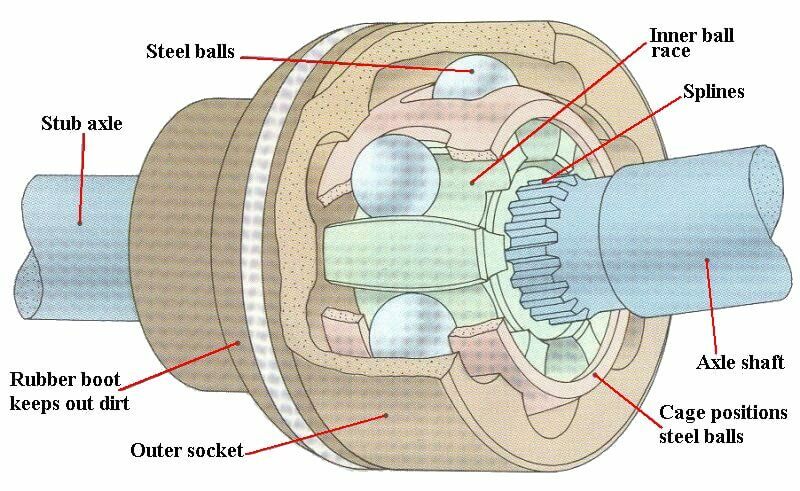 An automobile’s front drive axle is the central shaft purposed for transferring torque from the transfer case to the wheels. The front drive axle is split axle into two half axles with differential and universal joints. Each half axle is connected to your car wheels by a constant velocity (CV) joint. 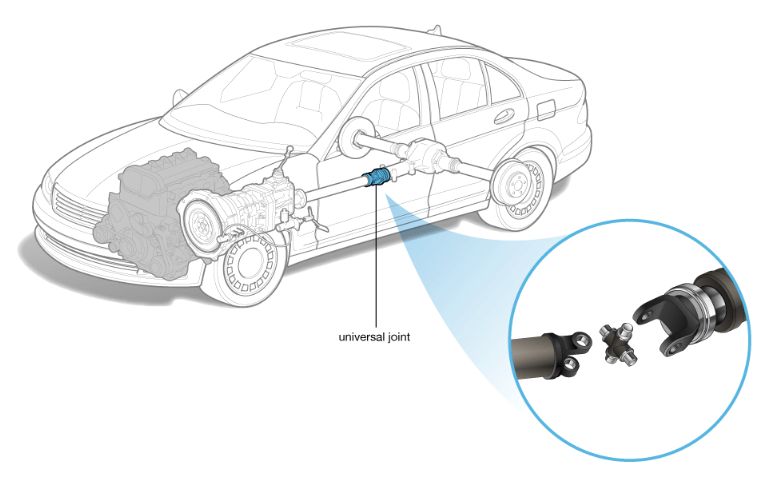 The CV joint allows the wheels to move freely and keeps your car’s body in balance. Since all the components of the drivetrain are in the front of the car, fwd cars don’t need long drive shafts to transfer torque to the wheels. Instead, a half-shaft connects from the transfer case to the wheel assembly. In place of U-joints, half-shafts connect the transaxle and the wheel assembly with constant velocity joints, or CV-joints for short. CV-joints use a ball bearing mechanism to reduce friction and allow for the more complex wheel movements used in front-wheel drive cars — remember, front-wheel drive cars not only have to move the car forward but also steer it left and right. The front wheel drive system was incredibly useful since the majority of all vehicles harness their engines in the front. So it was simple for engineers to connect the engine assembly to the front wheels with a couple of short drive axles. The most desired aspect of the FWD system is its fuel economy. Due to its compact design, this drivetrain reduces the vehicle’s overall weight and eliminates most energy losses. Front wheel drivetrains don’t have a long heavy driveshaft that requires separate differentials, this makes delivering power to the front wheels, from the engine much more efficient. 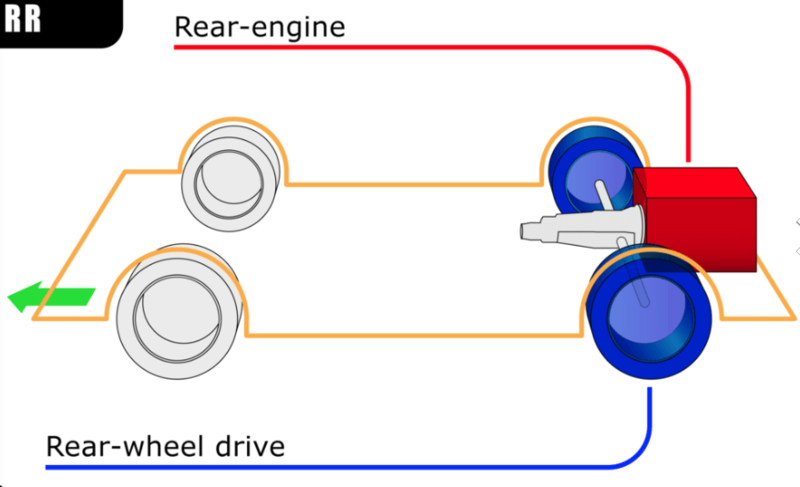 Rear Wheel Drive (RWD) is the classic drivetrain; for the longest time rear drive was basically the only optimal drivetrain system for many years. Rear wheel drive is the first and longest existing drivetrain, that is still used today on many cars and most trucks. This is because the RWD drive arrangement provides multiple benefits when compared to the front-wheel-drive. Typically associated with a parallel mounted engine where transmission is bolted directly to it. This component combination sends power via a driveshaft to the differential unit at the rear axle. Rear-wheel-drive cars require a driveshaft. To accommodate it, there must be an interior hump down the middle of the passenger cabin. For vehicles with RWD, the transmission is attached to the rear of the engine to a connecting flywheel. The transmission takes the spinning movement “torque” from the engine’s crankshaft and passes it along to the driveshaft. 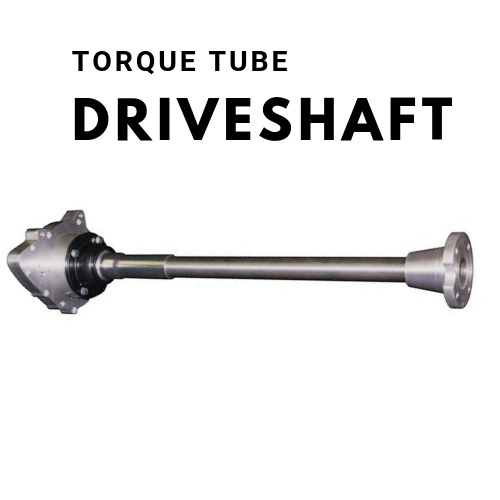 The driveshaft is a spinning cylindrical tube that connects to the rear of the transmission to the rear differential. Drive shaft designs come in two types: Hotchkiss and Torque Tube (the driveshaft itself is enclosed in a tube). 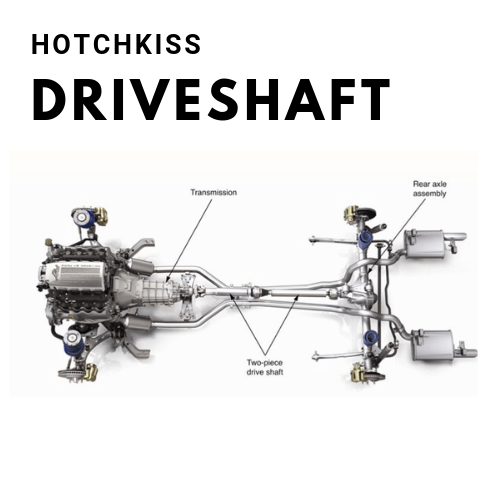 Hotchkiss driveshafts are the more common drivetrain because of their open design, meaning you can actually see the drive shaft spin beneath your car when it’s moving. Additionally, the Hotchkiss drive shaft uses two Universal-joints, unlike torque tubes. Torque Tube driveshafts are typically associated with older vehicles but are commonly used with today’s trucks and SUVs. It gets its name from the driveshaft itself being enclosed in a tube. Torque tubes connect the transmission and differential with a U-joint. 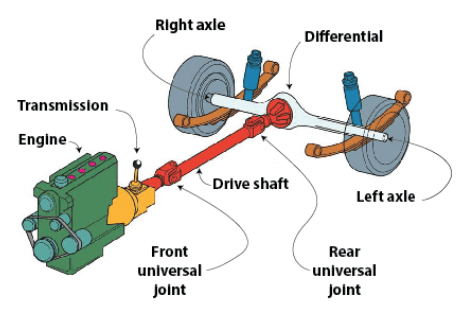 A universal joint’s (U-joint) purpose is to be the connecting point between drive shafts, allowing them to move up and down with the suspension. This is to keep consistent transmitted power when the drive shaft isn’t in a straight line between the transmission and drive wheels. The differential is the soccer-ball-sized part that sits between the two rear wheels. 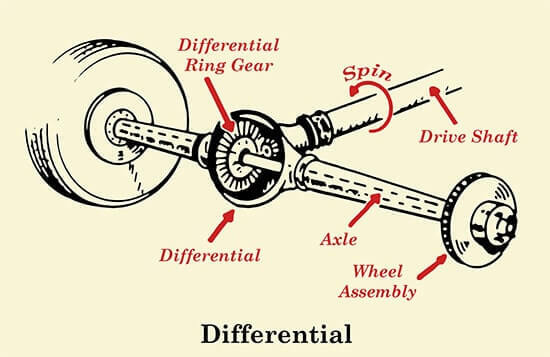 A differential is the component in which a rotating driveshaft can change direction; In a rear-wheel-drive car whose driveshaft runs the length of the car, the rear differential conforms its power to the rear axle that runs perpendicular to the car. The rear differential is needed to help aid 90-degree turns, it transfers the rotational engine power from the driveshaft to the rear wheels. These large components generally make rear-wheel-drive cars less fuel-efficient than front-wheel-drive vehicles due to the components weight. It gets its name “differential” because it allows the two rear wheels that are on the same axle to move at different speeds. See How Differential Steering Works! A common instance is making turns around the corner or bends, so an understandable example is when you make a RIGHT turn. In this case, your inside wheel (the passenger side) travels less of a distance than your outside wheel (the driver side). To keep up with the inside wheel, the outside wheel must spin slightly faster, your differential is what makes this possible. Consequently, if there was a solid connection between both wheels, one of the wheels would skid in order to keep the axle moving. Interestingly enough, there are different types of rear wheel drivetrain alternatives. One of the most unique types of RWD cars is having an engine on the back-side of the car, along with a transmission just like FWD cars, but reversed. This is known as Rear Engine Rear Wheel Drive. This is typically seen in drag racing cars, but one of the earliest and iconic examples of this system would be the Type-1 VW Beetle dragster known as HERBIE! 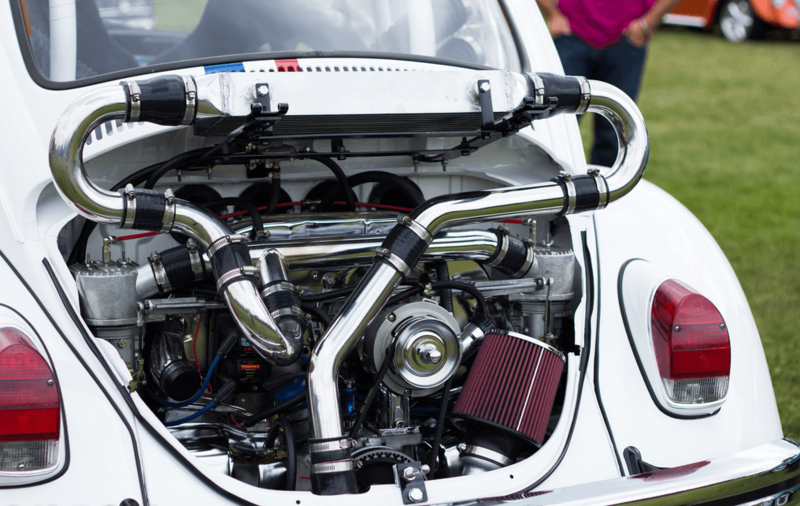 This Punch Buggy‘s drivetrain is RWD with a rear engine. Front-wheel-drive systems tend to “die-out” much faster than rear-wheel-drive systems. If that isn’t enough, the front wheel tire lifespan can be compromised because of consistent weight stress, on top of the responsibility to handle all of the acceleration and steering forces as well as much of the braking. Aside from the trans-axle, driveshaft and rear differential, the difference between FWD and RWD are the reversed components. PRO: Cheaper Vehicles, front-wheel-drivetrain systems are the cheaper drivetrain in vehicles plays a big part in economics, which is why cheap small cars are growing in availability. PRO: Better Fuel efficiency, Optimal mile per gallon fuel efficiency remains the main reason most cars today are deployed with front-wheel-drive models. PRO: Vehicle Weight for front-wheel drivetrain’s is reduced vehicle due to less component weight. CON: Torque Steer occurs during vehicle acceleration, an unequal amount of power is distributed to the front wheels, causing the vehicle to “pull” in two directions, the driver’s side or passenger’s side. Additionally, when it comes to turning, front-wheel-drive vehicles turning radius is limited because all of the “powertrain and drivetrain” components are in the front prevent the front wheels from being turned sharply. PRO: Acceleration, Rear-wheel drive offers better initial-acceleration than front-wheel drive the because weight is transferred to the rear of the car upon accelerating, which boosts traction. PRO: Braking with rear wheel drive is superior when compared to FWD vehicles. PRO: Drifting, Rear-wheel drive permits expert drivers to use various techniques to slide the rear end around corners (drifting), which is a skill most useful in racing. PRO: Stability and Control with rear-wheel drivetrain arrangements split the jobs of steering and driving the vehicle. For instance, when using the gas pedal in an RWD vehicle, the weight transfers to the rear allowing all the acceleration and weight to be carried by the engine power. The front wheels focus on directing the vehicle, eliminating torque steer (a common problem with FWD drivetrains). Weight distribution is more equally balanced to each tire, which in turn provides better steering and handling (although bad road conditions will cause a lack of traction for RWD). CON: Fishtailing is noted to be one of the biggest problems with rear wheel drive vehicles. Fishtailing is a vehicle handling problem which occurs when the rear wheels lose traction, resulting in over-steer. This can be caused by low friction surfaces when entering a turn/curve too quickly. A Four-wheel-drive (4WD) also known as a 4 x 4, is a vehicle with a two-axled vehicle drivetrain capable of simultaneously providing torque to all Four of its wheels. 4WD torque settings may be full-time or on-demand “part-time” this is usually controlled by a lever or switch associated with the transfer case providing additional gear ranges. When a four-wheeled vehicle is directed to supply its torque to both axles, this can be described as “all-wheel drive” (AWD). However, “four-wheel drive” typically refers to a set of specific components and function to its wheel-set. Most 4WD systems low and high ranges are usually activated with a electronic switch or a floor-mounted mechanical lever. Whether electronically or mechanically activated, the 4WD’s low setting provides a greater torque setting, purposed for pulling or climbing in an off-road environment. The low gear setting makes it easier for descending steep slopes on unstable surfaces without overwhelming the brakes. The default 4WD high setting is useful for slippery on-road situations, such as packed snow, ice, sand or gravel. All-wheel-drive (AWD) refers to a drivetrain capable of providing power to all its wheels whether full-time or on-demand much like 4WD. Except there are more forms of all-wheel drive such as: 6×6, 8×8 both of which may be either part-time, full-time, or independent (tesla only) all-wheel drive. AWD Part-time refers to on-demand typically where one axle is permanently connected to the drive, the other is being connected as needed. 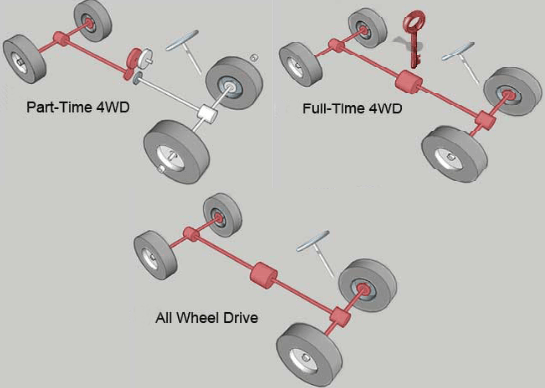 AWD Full-time refers to all axles are permanently connected, with or without a differential. Both All-Wheel-Drivetrains and 4-Wheel-Drivetrains introduce greater complexity to the drive system, adding both weight and cost. This is due to the transfer case, a drivetrain component directly associated with 4WD & AWD vehicles. 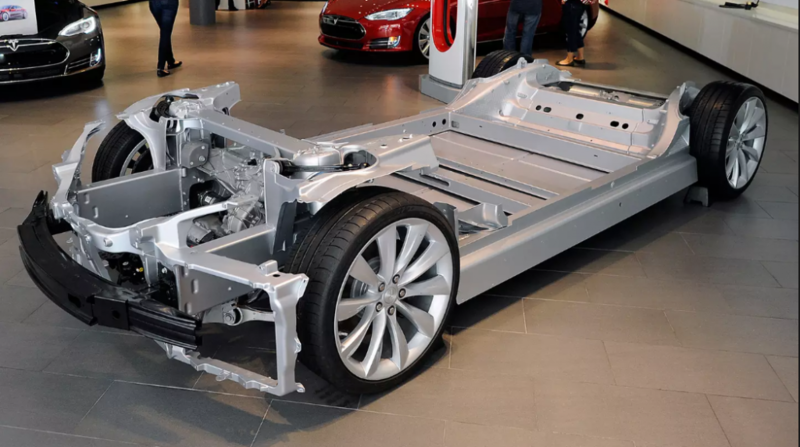 This extra weight generally means a reduction in fuel economy, although this can be mitigated with today’s more efficient engines, including hybrid, electric(such as the Tesla drivetrain) and diesel options. The inclusion of AWD or 4WD to a vehicle typically raises a vehicle’s price by about $1,500 up to nearly $4,000. For instance, those who do need more traction for their road conditions, having a vehicle with 4WD or AWD systems offers increased traction and handling capabilities under many circumstances. Both of these types of drivetrains are especially helpful on slick, loose or slippery surfaces because the system can direct power to the wheels that have the most traction. They can also help with some towing chores, such as pulling boats up wet, slippery launch ramps. It’s often understood that sometimes people will buy an AWD or 4WD vehicle for the intention of occasionally bringing their vehicle off-road. Regardless that 90 percent of the time they’ll be sitting in traffic or using the vehicle on paved roads. These people would benefit from buying a two-wheel-drive vehicle for their daily use, and renting an AWD car or 4WD truck or SUV for their ski trips. This tactic would save them money on the price of the car as well as overall fuel and maintenance costs. Despite their higher cost, systems that drive with all four wheels gives people that peace of mind and comfort when driving on hazardous road conditions. Both 4WD and AWD have front differentials and rear differentials. 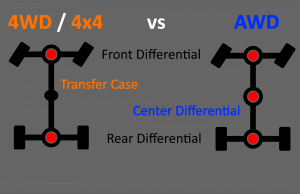 The difference between AWD and 4WD is that 4WD has a transfer case, while an AWD has a center differential. Also helping to justify those extra costs: Vehicles with an AWD or 4WD system usually have higher resale or trade-in values when compared to their two-wheel-drive counterparts. This is especially true in areas where inclement winter weather and rough terrain make such systems popular. So for most, the extra cost of a 4WD vehicle can pale in comparison, to the burden of repairing a damage to an ill-equipped two-wheel-drive vehicle. Some AWD systems also offer torque vectoring sensors that direct engine power to the wheels with the most traction regardless of which side they are on. AWD systems typically are used for cars and crossovers, because of their efficiency on pavement and well-maintained dirt and gravel roads. The Four-Wheel Drivetrain systems also come in part-time and full-time versions that are often found in trucks and SUVs that are designed for both on-road and off-road use. 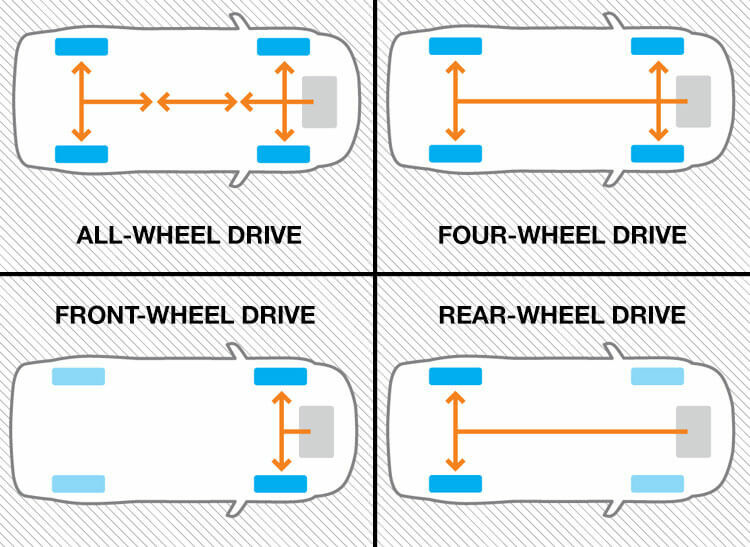 4WD part-time systems operate in two-wheel-drive mode until the driver/ onboard-computer decides that it’s time for all four wheels to share the work. 4WD Full-time is just what its name suggests, with all wheels being driven all the time. The development of anti-lock braking and traction control systems has greatly improved the handling characteristics of two-wheel-drive systems. Additionally, for many drivers, a two-wheel-drive vehicle with traction control is all they’ll ever need. With that said, knowing your vehicle needs in terms of passenger and cargo capabilities will make deciding that much easier. Although, road conditions such as terrain and weather conditions also play a huge factor in deciding the ideal vehicle for your needs. Adding 4WD and AWD systems to a vehicle increases overall cost in fuel efficiency because of increased weight and drag on the drivetrain. As traction control becomes more common on both front- and rear-wheel-drive cars, the advantages of 4WD and AWD have been reduced somewhat. 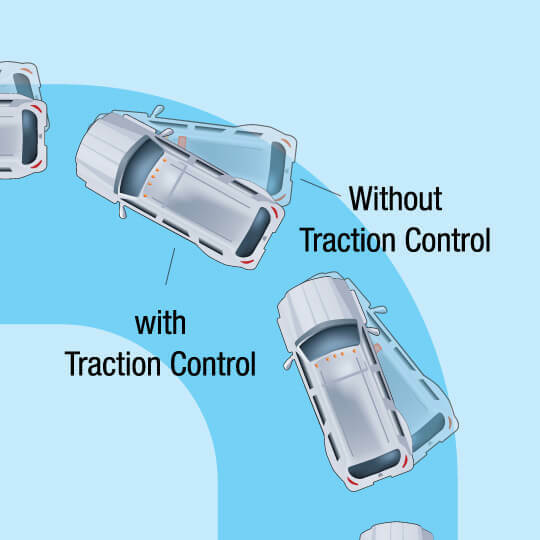 Although traction control is standard on most cars and trucks today, a RWD vehicle with traction control will have a better chance to maintain control in slippery conditions. These models are still usually at a disadvantage compared to their front-wheel-drive counterparts. In the end, there is no “best” drivetrain layout. The only thing that matters is what’s best for you when choosing from among several different layouts with different characteristics. A good car dealer can help sort out the pluses and minuses of the type of system that best meets your needs but, nothing beats going into the dealership already understanding the differences. Every brand-new car will come with a manufacturer factory warranty, this is an auto industry standard. Some automakers will class things by distinguishing drivetrain components and powertrain components as well as bumper-to-bumper coverage. Regardless, a warranty directly from the manufacturer is a “promising insurance” — that your car will work a certain way for a guaranteed amount of time. If for whatever reason during the grace period, the vehicle experiences some sort of drivetrain malfunction. This is the time in which you utilize their service to repair/fix the issue. What is a Drivetrain Warranty, and What Does It Cover? Drivetrain components refer to the parts that deliver power to the wheels. When either automakers or vehicle protection providers bring up drivetrain components, they’re referring to the: Transfer Case (AWD, 4WD), Transmission, Transaxle (FWD), Flywheel, Clutch, Gearbox, Rear axle & Bevel Gear (RWD), The Torque converter, Propeller shaft, Differential, and Final drive. Powertrain components are the parts that mechanically propel a vehicle in the first place as opposed to keeping it moving. A drivetrain warranty includes coverage for the transmission, driveshaft, axles, and wheels, a drivetrain warranty does NOT cover the motor/engine. Therefore, the biggest difference between a drivetrain warranty vs powertrain warranty, is that a drivetrain warranty DOES NOT cover engine related components such as: pistons, piston rings, crankshaft, main bearings, connecting rods, rod bearings, timing chain tensioner, timing gears, intake valves, exhaust valves, valve guides, oil pump, push rods, rocker arms, rocker arm shafts, hydraulic lifters, solid lifters, and the harmonic balancer. Meanwhile, a powertrain warranty would cover all of the previously mentioned parts. What is the Powertrain Plus Warranty? It is better to go the “extra mile” and invest in a powertrain warranty, rather than just a drivetrain warranty? YES, simply because the coverage is more inclusive and desirable. Any and all car owners should invest into some sort of powertrain coverage. 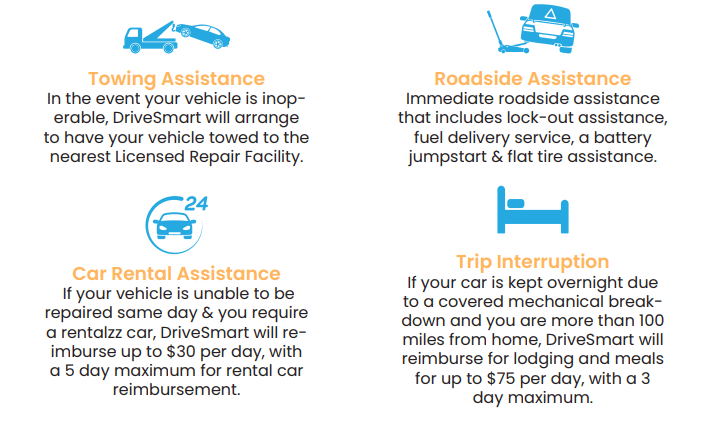 Additionally, if you want the best possible powertrain coverage, look into DriveSmart’s Powertrain Plus Warranty. Which covers mechanical failures with the: engine, transmission, differential assembly, drive axle, a transfer unit, cooling system, air conditioning system, fuel system, electrical systems, steering, and brakes. Which covers mechanical failures with the: engine, transmission, differential assembly, drive axle, a transfer unit, cooling system, air conditioning system, fuel system, electrical systems, steering, and brakes.